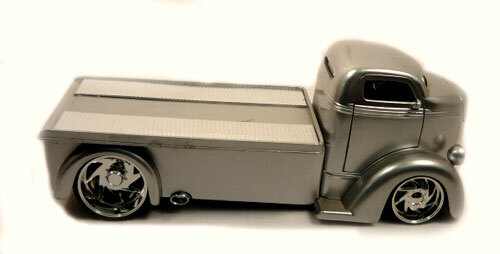 Cool Wrecker in our 1947 Ford Coe Tow Truck 1:24th Scale by Jada and of their Bigtime Muscle Die Cast Collection. Our Ford Coe has door that opens from front to back to reveal a black interior with chrome peddles, steering wheel and shifter. The bed has chrome tire runners and it slide back to fit a car on it. It comes with big chrome wheels and skinny black wall tires. = 9" Long x 3.25" Wide x 3.25" High.